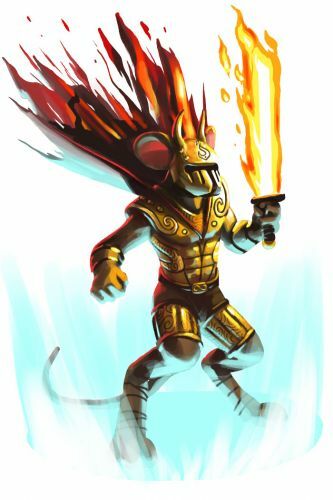 The Warmonger Mouse is a breed of mouse found in the Fiery Warpath location. It can be attracted and caught only during Wave Four. They are known to drop either the Oasis Bead, Sandblasted Metal or Sphynx Crystal on their first capture, but with subsequent catches, these three particular loot drops become more closely guarded. They are also known to drop Lucky Power Charms, Super Luck Charms and Super Power Charms, as additional loot, only when the Monger Charm is armed. It is known to drop an Ancient Relic as loot. Catching the Warmonger Mouse is one requirement for traveling to the Muridae Market. Required Power Types: None Other Requirements: ?? The Warmonger is a most fearsome general of the Marching Flame. Harnessing an inferno blade, the Warmonger makes a sweeping conquest of all that stands in its path and gives unquestioned orders down its ranks. None yet have challenged this Warmonger and lived to tell the tale. Warmonger Mice have no specific preference for any kind of cheese. The Warmonger Mouse can be encountered and attracted throughout Wave Four, but is immune to capture until twelve Theurgy Warden Mice have been caught. Using Ultimate Charm will override this immunity. Catching a Warmonger Mouse with a Monger Charm armed increases the variety of charms and quality of orbs that are dropped as loot by the mouse. The Warmonger Mouse drops the Warmonger Egg and Warpath Egg during the annual Spring Egg Hunt. Warmonger Mice were introduced on 22 March 2011 with the release of the Sandtail Desert region. During the Spring Egg Hunt 2012, the Warmonger mouse began dropping a bonus Warpath Egg as loot for hunters who had obtained the Eggscavator. Warmonger Mice began dropping Ancient Relic as loot on 29 August 2012. This page was last edited on 5 September 2017, at 20:41.